We’re launching the Tavistock and District Local Economic Blueprint on Friday 6th November at the Tavistock Chamber Business Show. Join us for the Launch Presentation at 12:30 … and come along and have a chat at our stand. We’ll be there from 09:30 to 17:00. The Blueprint looks at how far the £120m spent each year in and around Tavistock on food and energy benefits the local economy, and what opportunities there are for these sectors to deliver more for our future health, wellbeing, resilience and prosperity? The first section of our report, focusing on food and drink, is now available here to download. Over £80m a year spent on food and drink by people living in or visiting the area – but most not locally produced. So a marginal shift towards local supply chains could significantly help the local economy. We look forward to seeing you on the 6th November in Tavistock Town Hall. This entry was posted in Uncategorized on October 24, 2015 by Transition Tavistock. The government’s proposed changes to Feed-In Tariffs (FIT) will adversely impact community energy groups across the South West, including here in the Tavistock and Callington areas – Tamar Energy Community, Peter Tavy Community Hydro and SHARE. Community energy is an important way to enable local people to have more control, and say, over their energy, and for us to work together to reduce our costs. Developing local community owned projects will help us develop opportunities for local supply at, we hope, more advantageous local prices. This is not just a pipedream. A pilot projects is underway in Wadebridge, Cornwall, to bring this closer to reality. The government’s proposals are for a dramatic reduction in FITs from 1st January 2016. Locally generated energy brings jobs and investment to the region and these benefits are now at risk of being lost. A more gradual change is recommended with continued support for community owned projects. If you’d like to help us and participate in the Day of Action please write to your local MP (Geoffrey Cox MP – West Devon and Torridge; Sheryll Murray MP – S.E. Cornwall) and let him/her know how the proposed changes in the Feed-in Tariff (FIT) review will affect community renewable energy projects across the south west; and ask him/her to send a letter on your behalf to the Secretary of State, Amber Rudd MP. We will be meeting Geoffrey Cox MP on Saturday October 17th at 13:30. If you would like to sign a letter for us to take along to the meeting please come to Bedford Square on Saturday 17th Oct (tomorrow) between 12:00 and 13:00.
a letter to send to Geoffrey Cox MP or Sheryll Murray MP. a short document which explains the proposed changes in the FIT and the implications. A number of community energy groups across the area have also got together to make this short film. You can also find more information here and on the 10:10 website (http://www.1010uk.org); and you can sign the petition on the Parliament website. This entry was posted in Uncategorized on October 16, 2015 by Transition Tavistock. 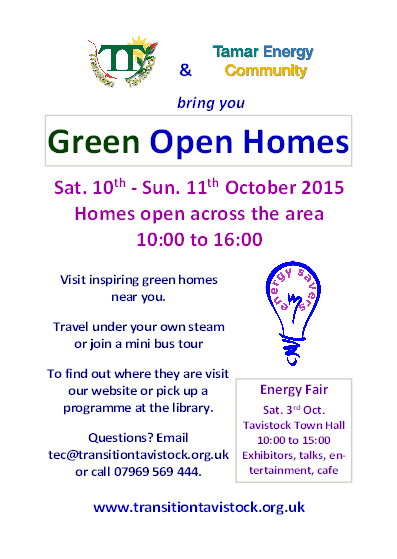 This weekend – Sat 10th and Sun 11th October – there are twelve local householders and businesses opening their doors for our Green Open Homes weekend to share with you what they’ve done to improve their home comfort and reduce their energy use. … and sharing lessons learnt. There are homes open from Roborough to Lydford and from Merrivale to Chipshop. Find out more about how black blinds absorb sunlight and warmth during the day in Roborough; visit two homes with external wall insulation in Tavistock; check out the further improvements to Bush Park on the edge of Lydford with the installation of a biomass boiler. This is also an opportunity to see backstage at Dartmoor Holidays on the edge of Peter Tavy and Woodovis Park nr. Chipshop. Woodovis has won lots of awards for their sustainable practices. You can also see how Merrivale Farm has used In-Form-Concrete to renovate a barn for use as an Office and Training Room. There are older homes which have been renovated and more modern homes which have been improved. There are also several with small holdings and productive gardens for those interested. More details here including an overview of all the homes. If you have any questions please get in touch at info@transitiontavistock.org.uk; 07969-569-444. Please share this event with your friends, family and neighbours. You can download a flyer here.or a programme for the day here. This entry was posted in Uncategorized on October 9, 2015 by Transition Tavistock.